Little Rock Nine - Webquest with Key (Civil Rights Movement) - This 6 page document contains a webquest and teachers key related to the basics of the Little Rock Nine during the Civil Rights Movement. It contains 16 questions from the history.com website. 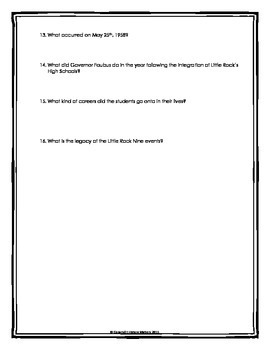 Your students will learn about the Little Rock Nine during the Civil Rights Movement. It covers all of the major people, themes and events of the settling of the Little Rock Nine during the Civil Rights Movement. Specifically, your students will learn about the events of the Little Rock Nine, the students and their experiences, and much more! 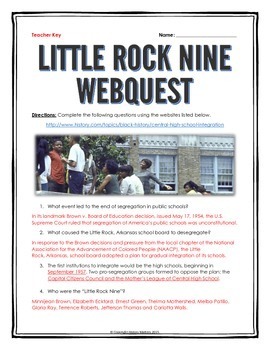 A great tool to teach the history of the Little Rock Nine during the Civil Rights Movement and their importance in the history of the United States. The teachers key is detailed and will make marking the webquest or going over it with your students easy and simple. Would also make a great activity for a substitute or for homework if students have access to the internet at home! 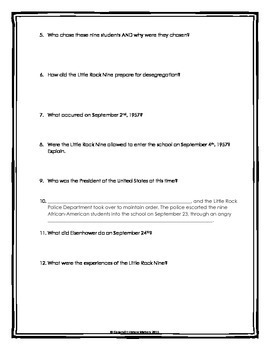 A great activity to learn about the history of the Little Rock Nine during the Civil Rights Movement.